This is the second dial in the pair. As can be deduced by the angle of the gnomon , this wall of the Shrewsbury Public library faces in a broadly south-east direction. It has not been possible, as yet, to determine when the dial was first put in place. The building itself was erected between 1627 and 1630, as part of the original Shrewsbury School, founded by Edward VI in 1552. 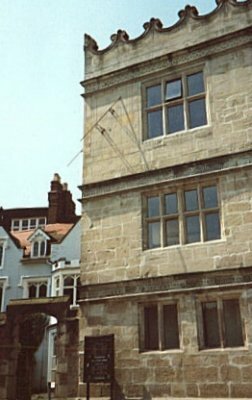 The sundial is probably a later 18th century addition.